There's a new LTE tablet headed to AT&T, and it looks pretty familiar. The LG G Pad X 10.1 will launch via the carrier's online shop on September 4th and will appear in stores on September 11th. AT&T has been stingy with the specs, but this device looks like a tweaked version of the recently announced G Pad II 10.1. 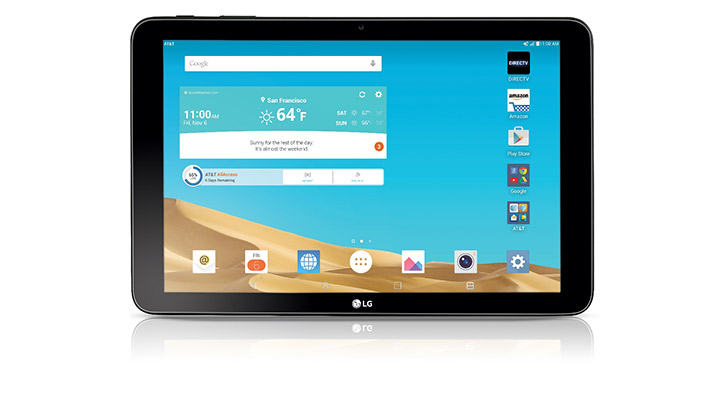 According to AT&T, the LG G Pad X 10.1 has a 7400mAh battery, quad-core 2.26GHz ARM chip, and Android 5.1.1. That matches what we know about the G Pad II 10.1, so I think we can safely assume that's a Snapdragon 800 SoC. The 10.1-inch LCD is probably 1920x1200 as well. AT&T is also pushing a DirecTV app with this tablet for some reason. It will only be of any use to people who subscribe to DirecTV. If you're interested, the LG G Pad X 10.1 on AT&T will cost you $17.50 per month on a 20-month installment plan or $249.99 with a contract. AT&T didn't list a full price for the tablet, but I'd wager it'll be $350 based on the installment payments.